I also have a special collection for keychains and charms, so instead of letting them get grouped with the flat and 'other' items, I gather them here. 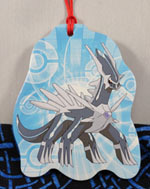 See the Figures page for many more keychains! 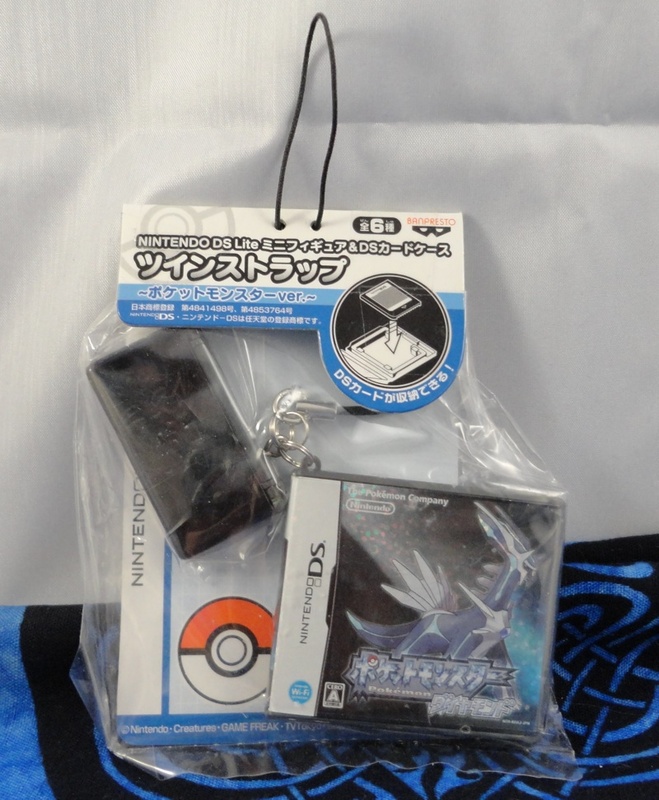 This was another item that finally showed up on Yahoo Japan that I didn't even know I was waiting on. 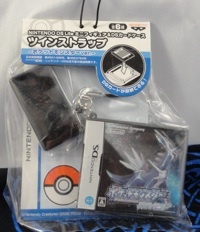 I won it cheaply and received it brand new in the package! 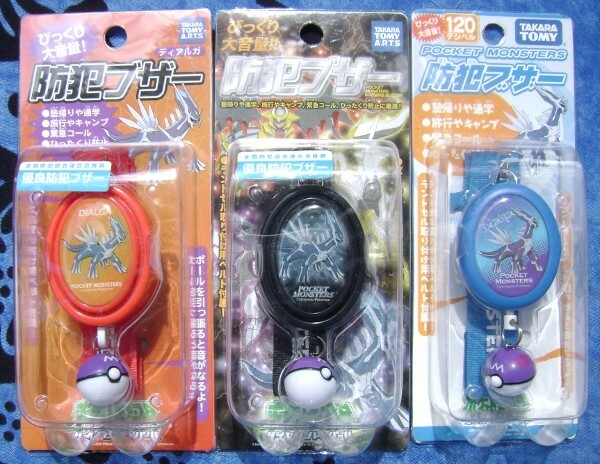 This series looks to be early Diamond and Pearl release from 2006. 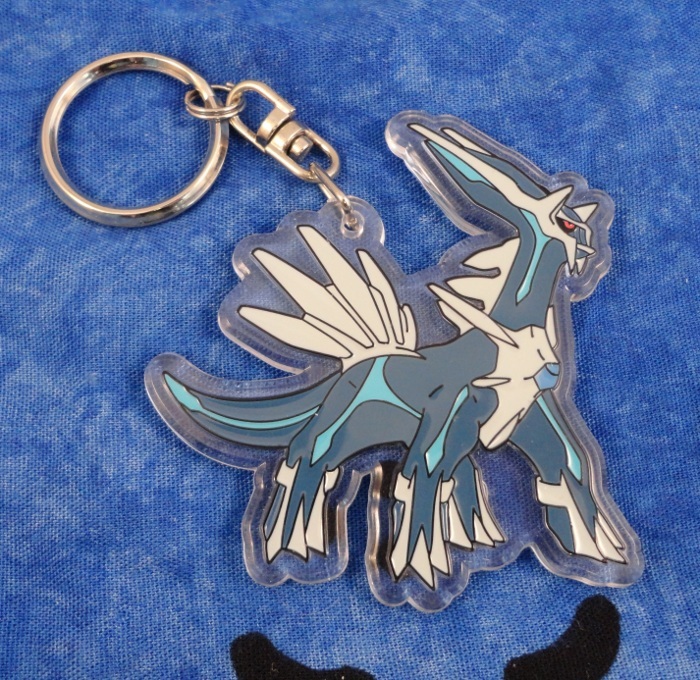 This keychain was a cheap (100 yen?) find on Yahoo Japan, and I was pleasantly surprised by how nicely made it is - it's very thick and has a nice feel to it. I'd definitely use it on my keychain if it weren't so rare! It's a 2007 promotion item (you can tell by the copyright), but I'd never seen one before this. 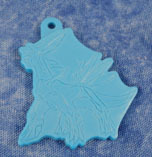 You can see the back of the keychain here. 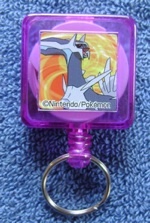 Although this keychain was released in 2006, it wasn't until 2013 that I even knew of its existence. 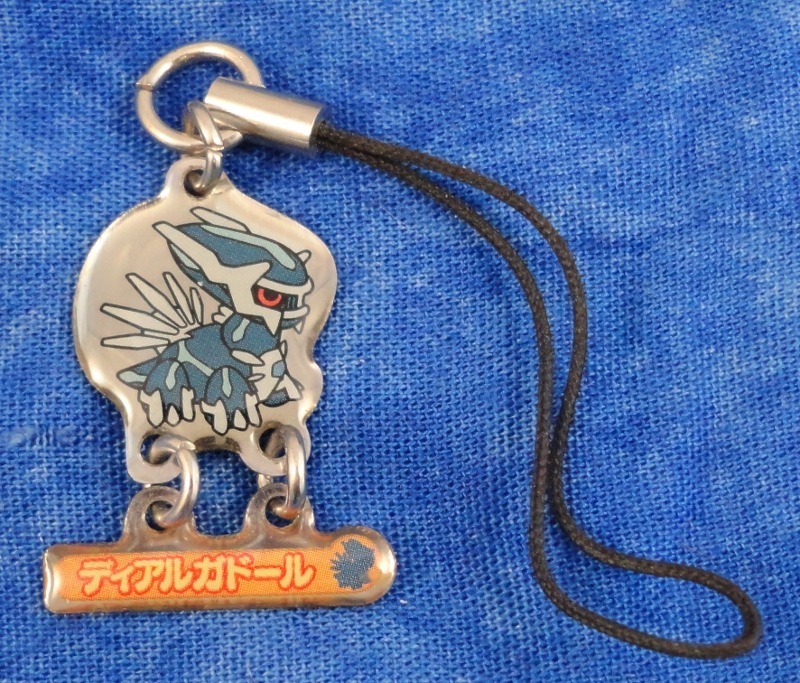 I suspect that it's so rare because it's meant to be customized: it comes with stickers that can be used to spell out a (Japanese) name, which are then applied to the keyring. Parents who bought these keychains new probably either assumed that no one would want a keychain with their kid's name on it, or they didn't want to offer such items up on the internet. In any case, I was lucky enough to find a seller on eBay who had a few items from this set up for auction, so I snapped this one up right away! I kept seeing this set on YJ, but the only seller refused to deal with deputy services, so I had no way to get it. Eventually I asked crunch385 to buy it for me as part of a trade, and here it is! That white bit on the left side is a Master Ball - pull it and let go, and the Dialga spins! 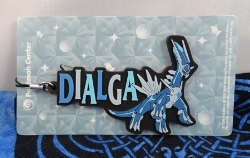 Declare that name loud and proud, Dialga! I like the unique design on this one. It seems to be fairly rare, but strangely, the few I have seen of this have all been new in the package! 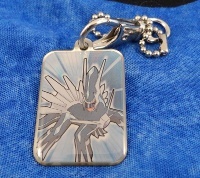 This reflective (and very large) keychain can be worn at night for increased safety. Neat! I now have 3 different versions of these! 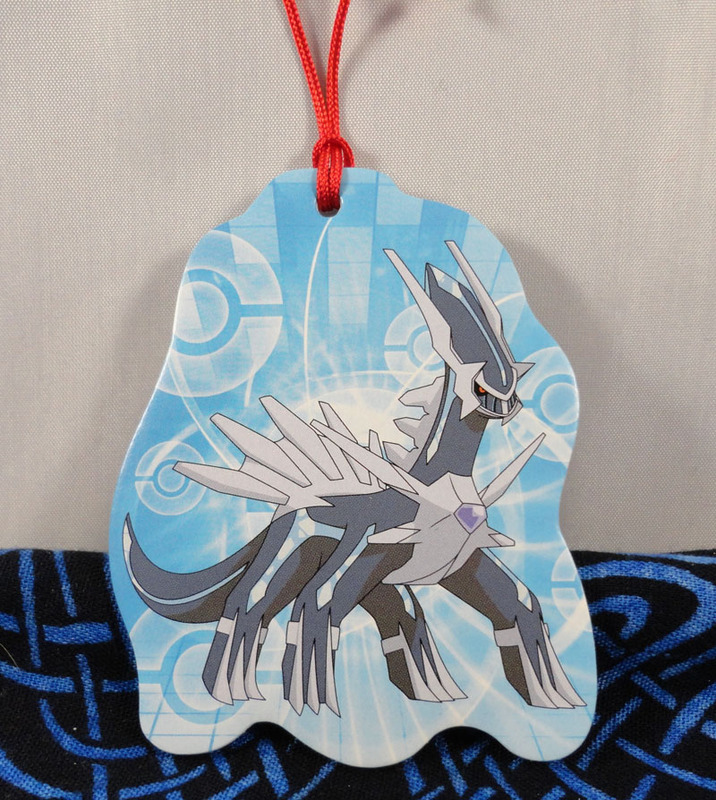 Each projects a different image of Dialga onto the wall (or whatever other flat surface you point it at). 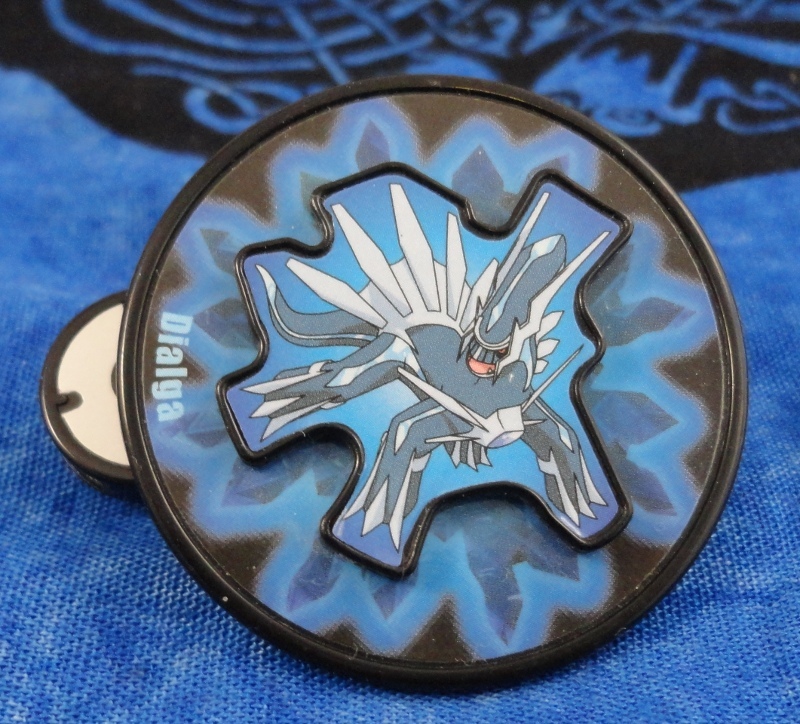 The 10th movie Master Ball projects a round image of Dialga, the 11th movie Master Ball projects half a 'battlefield' that can match up to fight with one of the others in the set, and the general Diamond and Pearl Great Ball projects another round image of Dialga in a different pose. 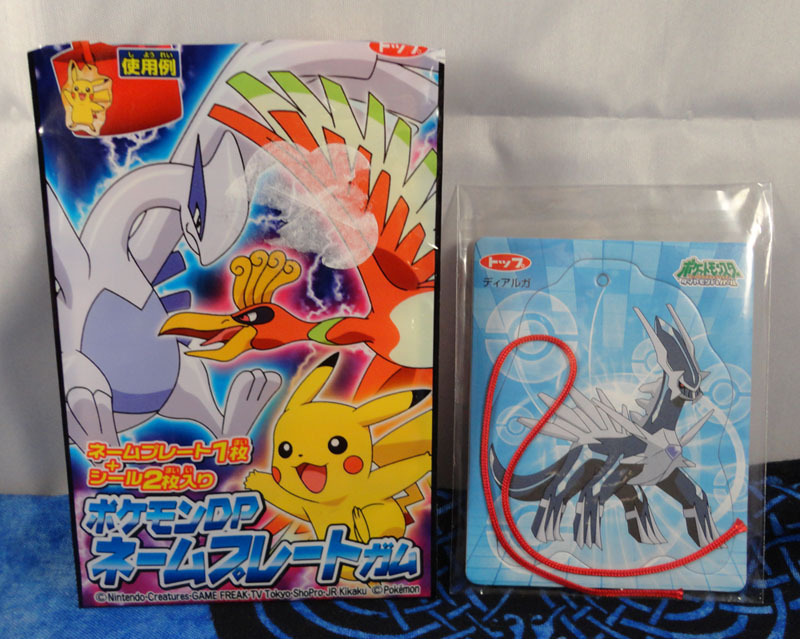 Both of these are from sets of 6, sold as movie promotional items (in the theater and at the Pokemon Center). There's both an A set and B set, each with three Pokemon on it. I found the older one on YJ, and grabbed two of the new sets during the 2009 promotion. 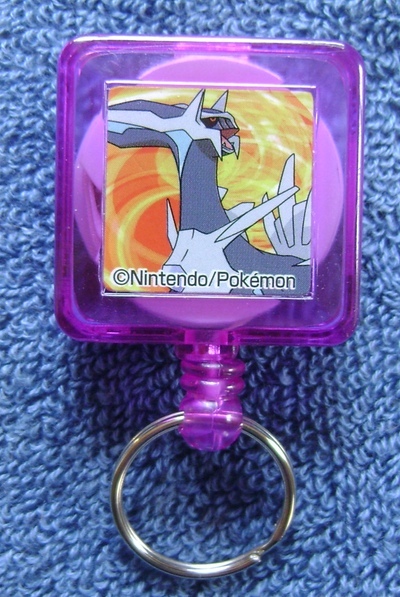 I saw this keychain up for auction and thought it might be the same as the above, but there was a gachapon insert, and the one I had already wasn't a gachapon item...so I took the chance and bought it, and now I'm quite glad I did! One more for my Diamond version collection. 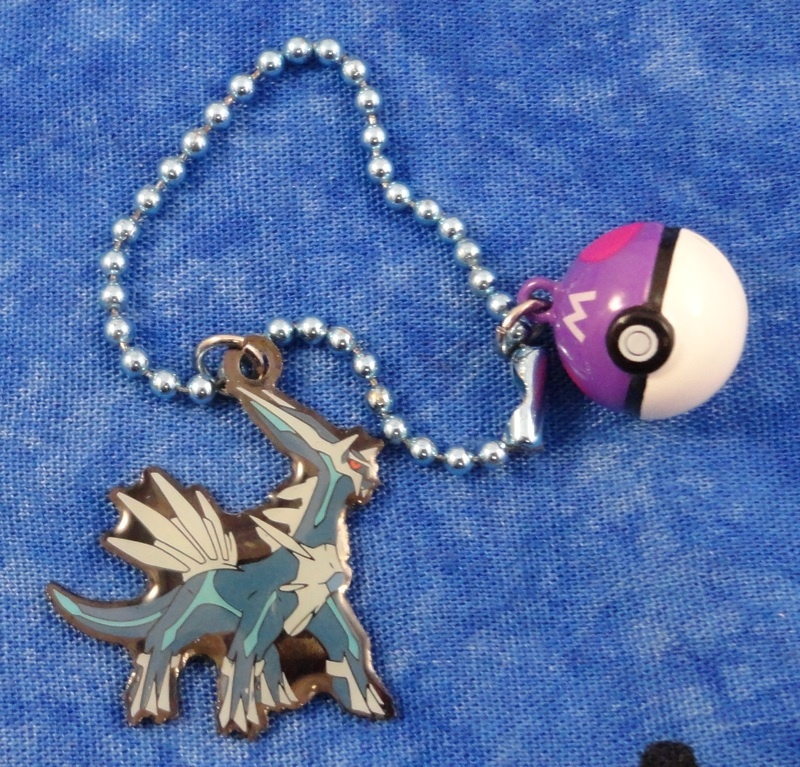 A slightly different keychain featuring Diamond and Dialga! This dog tag has spots on the back to write your name and blood type, the two most important parts of your personality. A spiffy flat metal keychain, from an Arceus movie gachapon set. I was very excited to find these in gachapon machines in Yokohama, because I hadn't known there was a Dialga in the series! I spent nearly all my hundred yen coins trying for him and finally got it just as I was running out. He actually came in a set with Chansey, but I took that one off and gave it away because that's just the kind of collector I am. 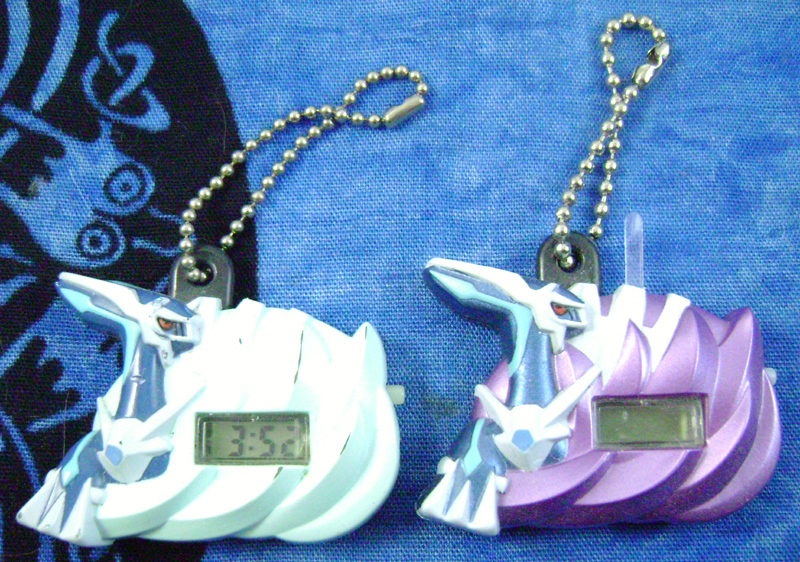 Nifty watch keychains in 2 different colors. Since I have 2 I used to wear the second one, which is why it's so beat up. This plastic keychain is pretty big and has nice bright colors. I'd use it, but I don't want to get it all dented up. 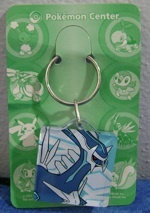 A tiny, flat and shiny keychain with a little bell Master Ball. 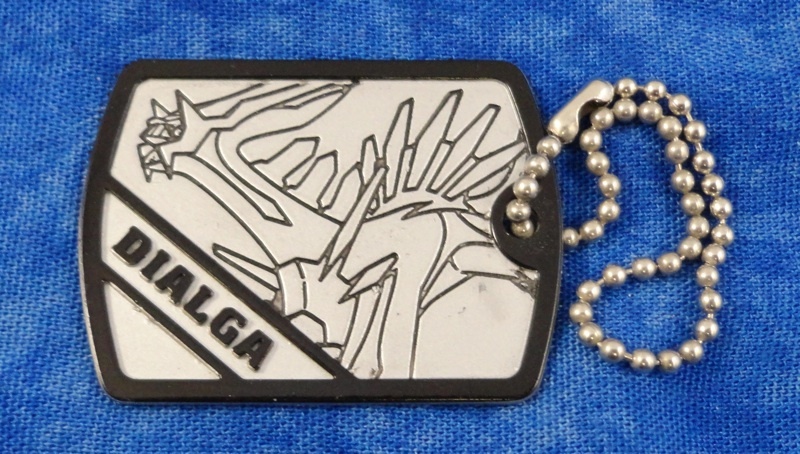 I had to buy about 12 boxes of these before I got Dialga, and even then I sold off the PorygonZ half. But it's well worth it! 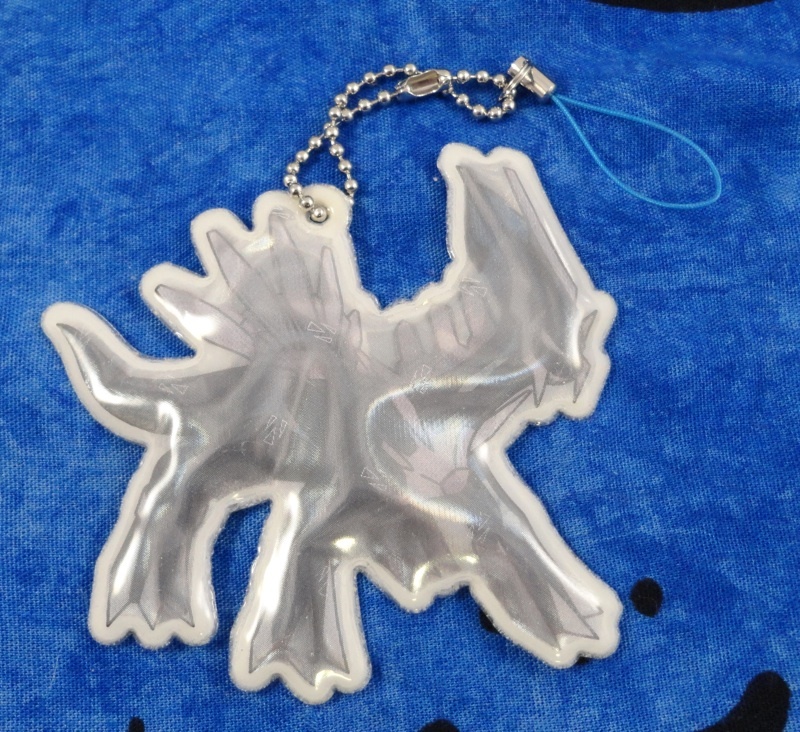 This was actually one of my first Dialga keychains. As a sort of spinoff to the soap figures (びっくらたまご) series, Bandai released this set of bath plates. 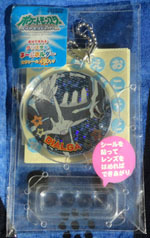 Inside a huge ball of bath salt (6 times the size of normal ones) is a package of 14 plates, one of which is this Dialga. I was a bit paranoid that I'd only get one random plate from the set, but was pleased to see a stack of these plates within the ball as it melted. 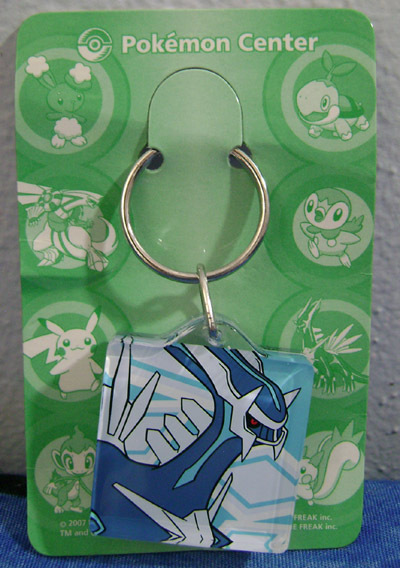 According to the suggestions on the back of the package, you can play rock paper scissors with the plates (since each has a symbol on the back, in addition to information about the Pokemon), or you can write your name on the back and hang it on a keychain with your soap figures, which also have hooks so that they can be used as keychains! According to the packaging (which the seller kindly included), this is part of a set of one blind-packed nameplate, a strap to hang it with, and 2 stickers. 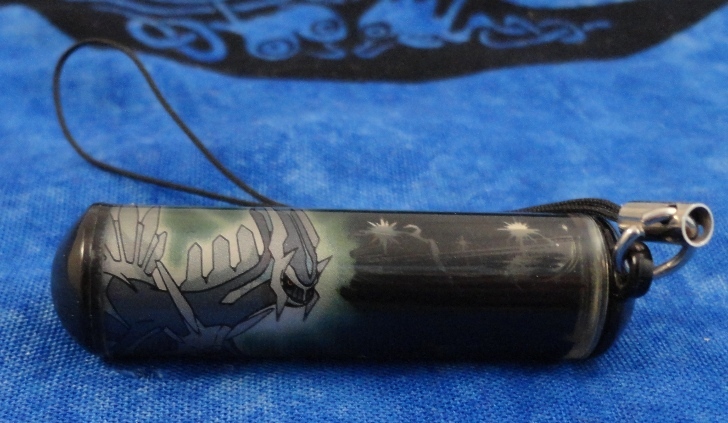 I guess the seller either wanted only the stickers, or wanted someone other than Dialga, because they put up the set for auction. I'm grateful that they did, instead of just throwing it away, because this is the first time I've seen it! It was either punch the nameplate out of the packaging or stick it up as a flat somewhere, so I opted to de-package it and just save a photo of how it looked when I got it, and you can see that here. 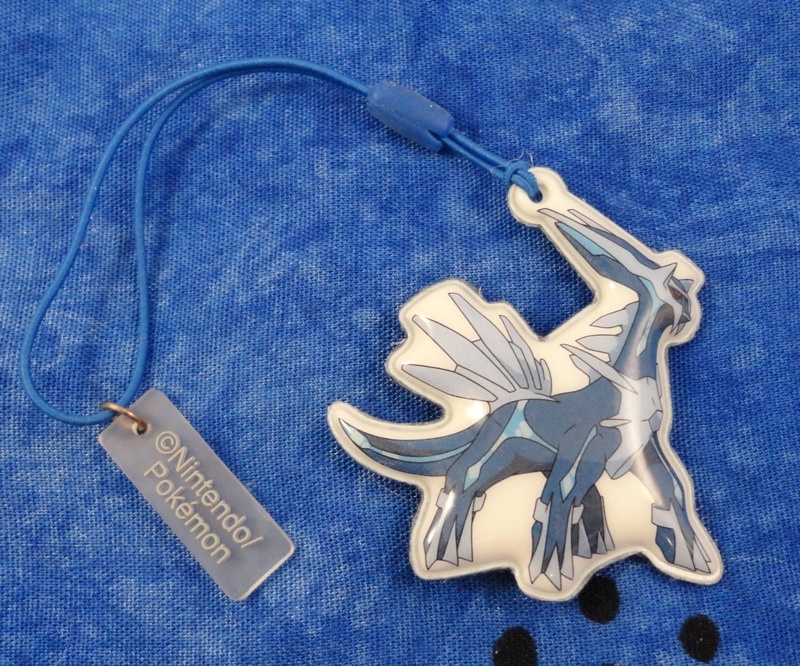 The package also has directions on how to tie the cord to the nameplate (which I did), and a suggested way to use it, which is kind of silly because it's so fragile it'd quickly get beaten up hanging up on a purse. Oh, and if you're wondering why it's called a nameplate, there is a spot on the back where you're supposed to write your name, probably to identify the owner of whatever you hang it on! 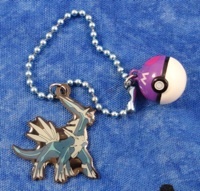 This keychain has a little bit of water (or something) inside so that a picture of Dialga floats back and forth from one side to the other. Part of a small collection of items featuring the Game Boy and DS games. 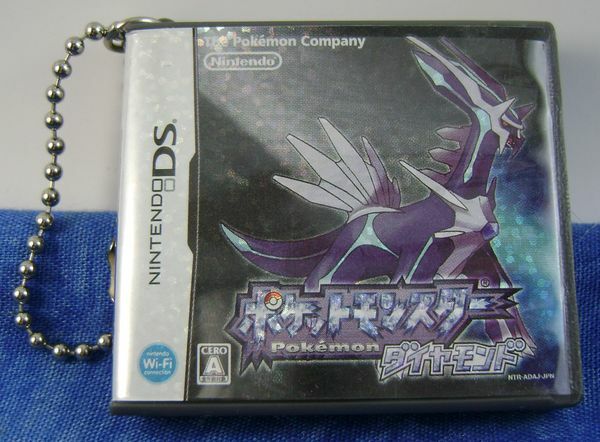 The Diamond box is quite realistic (it even has the screenshots and information about starting your journey in Sinnoh on the back) and can hold an actual DS cartridge! 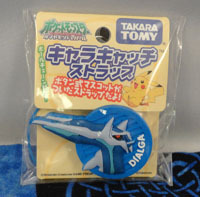 A nifty cleaner that seems a little less likely to scratch a screen than the figure versions. Why are these still in the package, when I open almost everything? Well, this is a security buzzer for children to pull when they feel threatened, that lets out a BIG noise. So it's like a car alarm for your kid! Given the nature of car alarms, I'm keeping these in the package so they don't go off by accident. 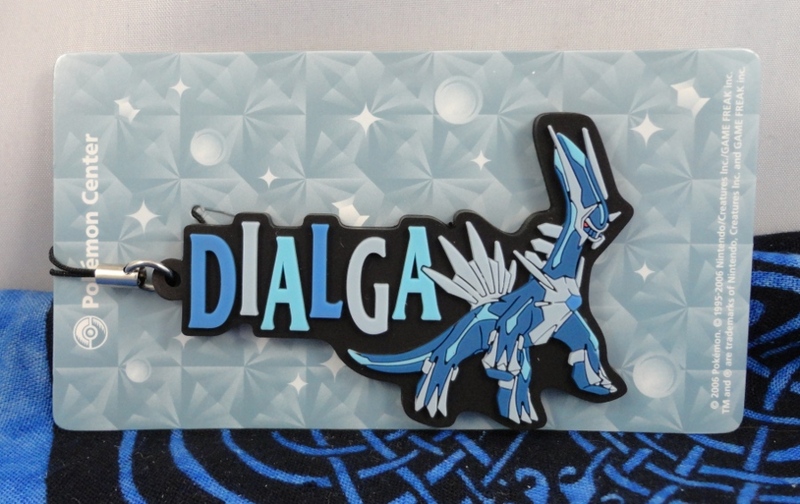 It's really hard to find Dialga stuff where it's in its Pokedoll form, but I found this phone strap! It's very tiny and very cute. 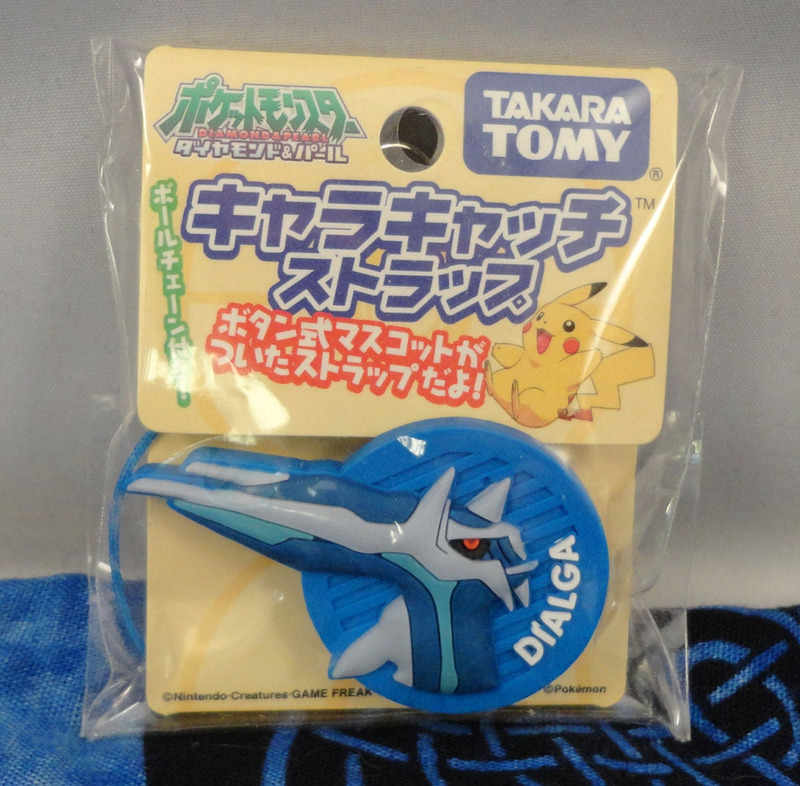 This is a gachapon item from the 10th movie promotion. I thought this was a little shoe clip-on when I originally got it, but looking at the text it seems to be some kind of strap. 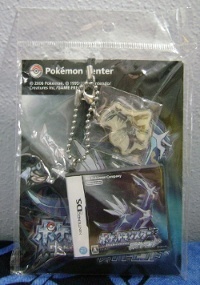 Source: ridi of pkmncollectors and Sunyshore! The charm on the left is the second (I'm missing the first!) 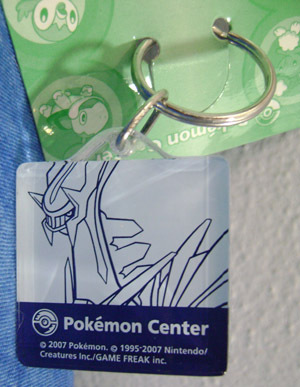 in a Pokemon Center series that features mostly legendaries and Pokemon prominent in the anime, or those featured in a Pokemon Center promotion. It was picked up for me by ridi when she was in Japan, and is now quite rare! It's easy enough to tell these charms apart due to the poses, but there are some other differences as well. 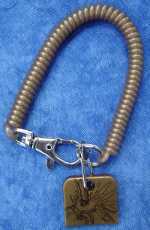 The clasp on the older (2006?) charm is larger, and the ring between the clasp and charm is smaller. 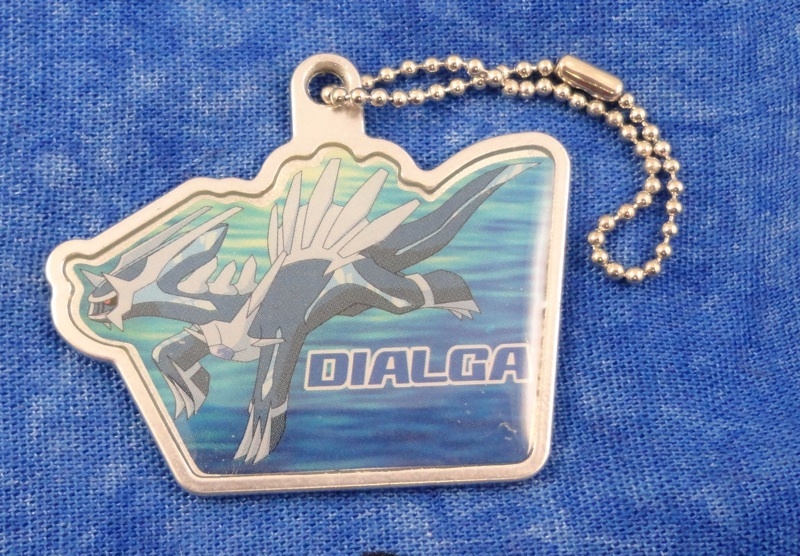 The blue on the older charm is a little deeper, and it just says (c) Pokemon on the back whereas the new charm (like all Pokedex charms) has Dialga's number. 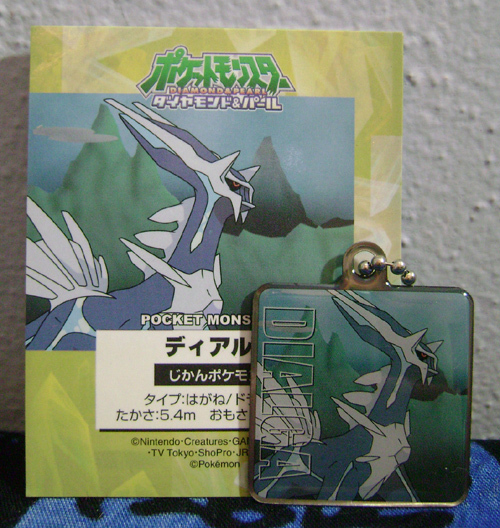 I took out my duplicate of the old charm that's still on the packaging (as you can see below), and was surprised to see that the older charm actually cost more - 180 yen retail price instead of the 150 yen that the single new charms cost. 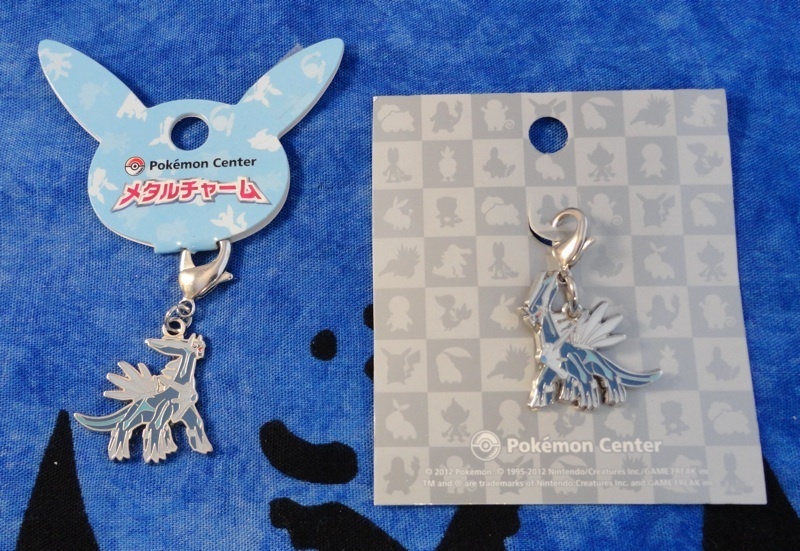 If I compare them closely, the newer charm does seem a little bit less well made, with thinner details and the ring seeming more likely to break. That isn't to say I don't recommend it, though! 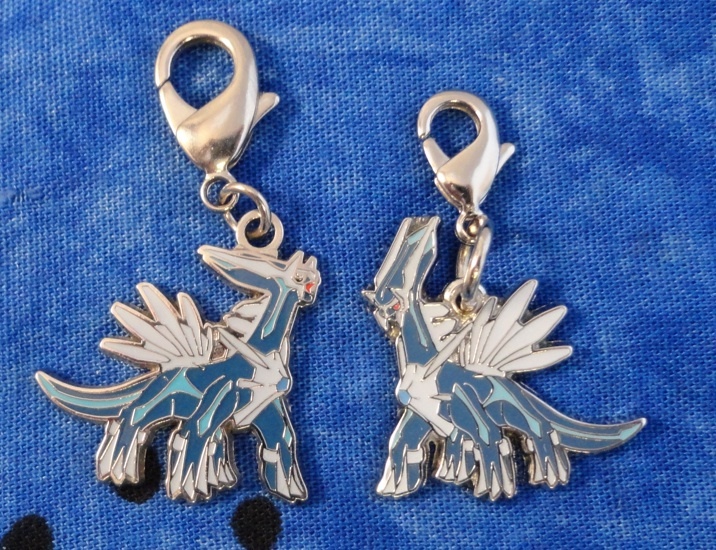 I'm super pleased to have both of these charms in my collection. One last thing to add to this long description - I took a photo of both with their packaging intact for reference as well. 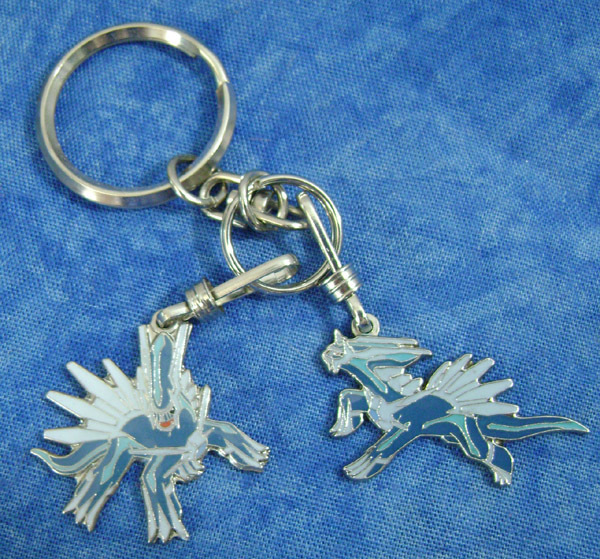 I love these charms. 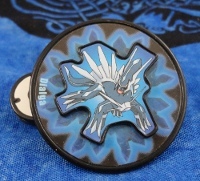 They're about 1" across, shaped to fit the Dialga, and lightly engraved with the Pokemon movie's logo on the back. 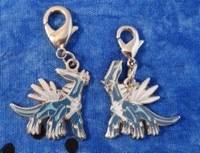 The silver charm on the left is the normal 10th Movie version, the gold one on the right is the 'secret' rarer version (also from the 10th movie), and the one on the bottom is the 12th movie version. 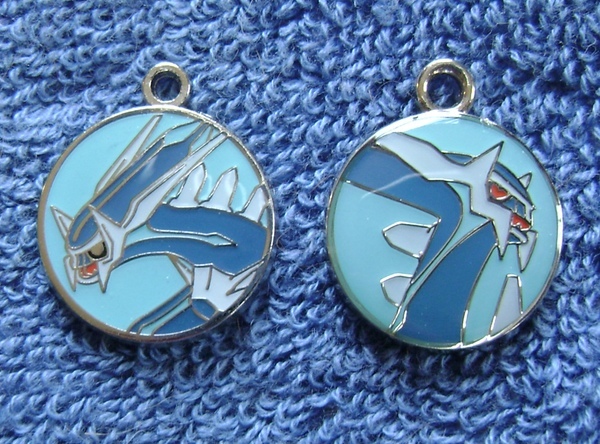 These pendants are part of larger charm sets, such as one that has Palkia and the three evolved Sinnoh starters. 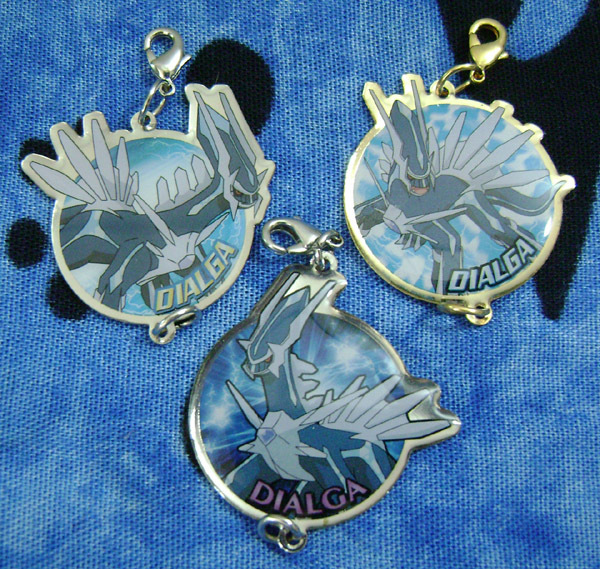 I thought it would be easier to separate the Dialga from the rest of them, but I had to actually pry open the chain to do so! 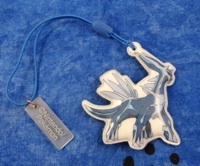 I've been looking for these charms on their own, but so far have yet to see any of them.